DALLAS, Aug. 14, 2018 /PRNewswire/ -- With over 2 million weddings1 each year in the United States, the #weddingseason struggle is real. Hotels.com knows how stressful tying the knot can be and wants brides and grooms everywhere to know we have their back. So, we're amplifying our already rewarding range of wedding services, including affordable group bookings and wedding registry, and giving soon-to-be-hitched guys and gals the chance to "do you" and get a little extra. Meet "Chaplain Obvious", a.k.a. Captain Obvious, the first-ever brand icon to become legally ordained and officiate weddings. 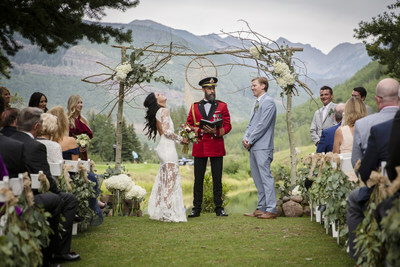 Chaplain Obvious just had his first gig in Vail, CO, and helped a local couple create an epic ceremony unlike anything their friends had seen before. Newlyweds Michael and Melissa Nelson are globetrotting college sweethearts with a deep love for travel - seriously, not only have they traveled the world together, they both work in the industry, too! - who were looking for a unique way to surprise their guests. Mission accomplished. View the video here. "Our lives literally revolve around travel, whether we are exploring a new city together, or helping others do the same," said newly-minted Mr. and Mrs. Nelson. "When it came to our wedding, it was important that we 'do us' and share our love for adventure in a unique and fun way and including 'Chaplain' Obvious in our big day was the best way we knew how! Hotels.com is our go-to, and we're thankful they helped us bring our story to life in such a personal way." Hotels.com knows wedding season isn't just about the happy couple -- in fact, over 75% of millennials attended weddings last year that required overnight travel, and a quartr of guests spent in excess of $500 on travel expenses alone2. Whether you're exhausted and broke AF from planning a wedding, or from attending one, we know you could use a reward for all your efforts. So, we're offering you the chance to win Hotels.com dolla, dolla bills for your next trip – wedding or otherwise! Just tell us the most unique thing you've seen at a wedding on Twitter from now through August 28 using #ChaplainObvious and you'll be entered for a chance to win a $2,500 Hotels.com gift card3. "Weddings are a big deal, and people want to celebrate with their friends, but are challenged with how to make it work within their budget and other commitments," said Katie Junod, general manager for Hotels.com in North America. "We want to make this wedding season as accessible as possible for everyone - bride, groom or goer - and prove along the way that you never have to sacrifice the chance to 'do you' at every turn." To learn more about #ChaplainObvious or to get rewarded with unbeatable accommodation offerings this wedding season (and beyond! ), visit https://www.hotels.com/page/chaplainobvious/. Hotels.com is the most rewarding way to book a place to stay. We really love travel and we know you do too. That's why we make it really easy to book with us. With hundreds of thousands of places to stay around the world and 90 local websites in 41 languages, Hotels.com has it all. So, whether you're looking for value in Vegas, treehouses in Thailand or villas in Venezuela, it's all just a click away. And with our "Reward-winning" loyalty program you earn free*** nights while you sleep and get access to instant savings like Secret Prices***…what could be better? Booking just got smarter too. With over 25 million real guest reviews and an app so easy to use that it's been downloaded more than 70 million times, you can be sure to find the perfect place for you. * The free night is exclusive of taxes and fees. The value of the reward night corresponds to the average accommodation price of the 10 previously collected overnight stays. Registration and booking are available through the http://www.hotels.com/ website, as well as the hotels.com app on the Apple Store and on Google Play. **Secret Prices are available to Hotels.com app users, Hotels.com Rewards members and individuals who unlock Secret Prices on the website by subscribing to Hotels.com by email. Secret Prices will be shown where the "Your Secret Price" banner is displayed on your search results. Available on selected hotels and selected dates only. Subject to full terms and conditions. 1: TripSavvy, "Wedding Statistics and Honeymoon Facts & Figures"
2: Wedding Travel research conducted by One Poll in July/August 2018. Data based on 2,000 respondents across the United States ages 18-34 who have been to a wedding as an adult. 3: Complete Terms & Conditions for #ChaplainObvious social media giveaway are available here: https://www.hotels.com/page/chaplainsweeps/.